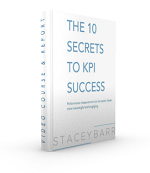 What is a KPI Owner Accountable For? Performance measures and accountability have an uncomfortable relationship. People don’t like to own measures or KPIs because of the fear of what they’ll be held accountable for. And yet can performance ever be expected to improve if no-one is accountable? Traditionally, a measure’s owner is held accountable for whether or not performance hits target. If the company profit doesn’t meet target, the Board holds the CEO accountable. If the percentage of customer problems that are solved in the first call is too low, the Customer Service Manager is held accountable. If the percentage of held desk calls that are answered within three rings is too low, the Help Desk operator is held accountable. We know from experience the kind of behaviour this type of accountability drives. The CEO will cut costs across the board, inspiring everyone to work smarter. The Customer Service Manager will change the definition of “solved” to get a better first-call resolution rate. The Held Desk operator will rush through the call she’s on to answer more within three rings. And what happens in all cases is the measure will improve in the short term. But there are consequences. Other measures will be sabotaged. Cutting costs means corners are cut and quality goes down. Changing the definition of ‘solved’ means problems come back into the pipeline again and cause bottlenecks. Rushing customers to end calls sooner makes them frustrated and dissatisfied. Accountability isn’t the problem. It’s what we hold people accountable for, when it comes to performance measures. Holding people accountable for hitting targets assumes people have full control over results. But the results are actually the product of business processes and systems, and people have to work within the constraints of these processes. W. Edwards Deming had much to say about this, pointing to the overwhelming observation that most of the constraints on performance are in the processes, not the people. 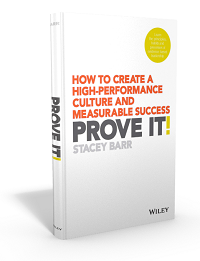 When someone is responsible for a specific business result, like problem resolution or accuracy of advice or eliminating rework, they can be accountable for routinely monitoring that result with a performance measure. This drives the behaviour of people focusing on the results that matter. When someone is responsible for monitoring a performance measure, they can be accountable for interpreting what that measure is telling them about the business result it measures. This drives the behaviour of people seeking feedback about how the results are actually tracking. When someone is responsible for interpreting a performance measure, they can be accountable for deciding what kind of action is needed, if at all. This drives the behaviour of people working on their processes, and not just in them. What does accountability mean in your organisation or company? How do people feel about it? Could the 3 accountability points proposed above work for you? Instead of “Holding People Accountable”, how about we mentor them in what skills they are not proficient in. Team them up with a partner in their position that is on their level to help them on what they do. As leadership we need to look more how to help and improve, instead of where to lay blame. To be a team we all have to do our part, and part of that part is strengthing other junior members on the team to be great assets to the team. Most of us were not hired because we needed to fill a spot. We were hired on talent, and talent needs to be developed not scorned for what they lack. Nicely said, Scott. Accountability and what people interpret it to mean can often get in the way of learning and collaborating. I do believe we need to be responsible for specific behaviours and results. But the word ‘accountability’ seems so loaded with the threat of blame that brings out just the opposite. Accountability is a significant issue where I work and I think you’re right Stacey, the issue is not with accountability but what we hold people accountable for. The issue is also about using accountability to shift the blame. I think there needs to be consistency and upfront agreement and understanding of what you are accountable for including and importantly collaboration between business, system and process owners for addressing problems. Yeah Adnan, that’s a good point, about accountability often being related to blame. So perhaps another point is to understand what it really means to be accountable, what the evidence is that someone is or is not being accountable, and what are the consequences of not being accountable. I believe team members need to be accountable for KPIs they own, but the targets need to be SMART, with a focus on Achievable. This doesn’t mean that they have control over everything (we never do in large organizations), but they have enough influence to make it happen. Otherwise, the KPI isn’t Specific enough for that person. Also, if the thought of not achieving a target (failing) drives fear, it’s because of a culture problem within the organization. Fail fast right? Finally, setting the targets should involve fair process to increase engagement in team members. SMART accountability is good, fear of failing is not. Great this I get hold people responsible and accountable for the effort and not the result. But how do segregate and measure this type of accountability – and know who on the team is not doing there job and who is doing their job amazingly? Kristina, I don’t believe in using measures to assess if someone is doing their job or not. That’s something that should be managed through a one-on-one relationship between the person and their manager. Measures only tell a very small part of any story, and when it comes to people as individuals, using measures is more often undignifying and unhelpful in understanding the story. So I cannot answer your question because I don’t specialise in measuring people, due to not believing in it.